Totally functional, it's just not very exciting is it? 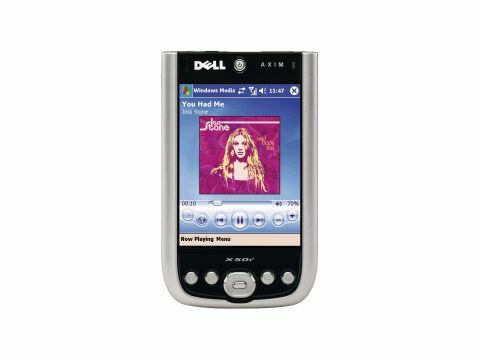 The Dell Axim X50 is by far the most appealing handheld the company has released to date. Weighing in at 167g, the Axim is still on the heavy side, but we found that it sat comfortably in the hand. Bluetooth on/off and voice recorder buttons are located on the side of the device, along with a handy locking switch. The headphone/headset jack and stylus holder are placed sensibly on the top. The tiny application launch buttons are usable, but the diminutive D-pad toggle might present difficulties for gamers with chubby fingers. The Intel 416MHz XScale PXA270 powers the device, so you can make the most of media and office applications. While 64MB RAM and 64MB ROM (34MB user accessible) is very much par for the course, SD(IO) and CompactFlash expansion slots allow users to store byte-hungry media files on memory cards. Dual expansion means you can add a GPS system or a camera and still have a slot left over for memory. The screen is a 3.5-inch QVGA screen and is bright and efficient. With the Windows Mobile 2003 Second Edition operating system, users can switch between landscape and portrait modes to view video clips and spreadsheets. Windows Media Player 10 is installed, the latest version with access to online stores and audio/video subscription services. Dell includes some useful software such as Data Backup, WLAN Utility, and Task Switcher. A desktop synchronisation cradle with an extra battery slot also comes in the box. If you need more from a PDA, you can opt for the more expensive Axim X50v (£350 inc. VAT), which comes with a superb 3.7-inch VGA screen and improved specifications. As a simple PDA, the Axim X50 is one of the more versatile units out there, and at this price point comes highly recommended.